“Here is a book of immense importance for literary studies, bringing to our attention that there is an alternative paradigm available for literature in the third millennium, if writers have the courage and the imagination to take it up." In The New Philosophy of Universalism Nicholas Hagger outlined a new philosophy that restates the order within the universe, the oneness of humankind and an infinite Reality perceived as Light; and its applications in many disciplines, including literature. In this work of literary Universalism which carries forward the thinking in T.S. Eliot’s ‘Tradition and the Individual Talent’ and other essays, Hagger traces the fundamental theme of world literature, which has alternating metaphysical and secular aspects: a quest for Reality and immortality; and condemnation of social vices in relation to an implied virtue. Since classical times these two antithetical traditions have periodically been synthesised by Universalists. Hagger sets out the world Universalist literary tradition: the writers who from ancient times have based their work on the fundamental Universalist theme. These can be found in the Graeco-Roman world, the Middle Ages and Renaissance, in the Baroque Age, in the Neoclassical, Romantic, Victorian and Modernist periods, and in the modern time. NICHOLAS HAGGER is a poet, man of letters, cultural historian and philosopher. He has lectured in English Literature at universities in Baghdad, Tripoli (Libya) and Japan (where he was a Professor), and is the author of more than 30 books. These include a substantial literary output of nearly 1,500 poems, over 300 classical odes, two poetic epics, five verse plays and a thousand stories, travelogues and innovatory works in literature, history and philosophy. Hagger adopts a historical and traditional approach to the philosophy of literature. 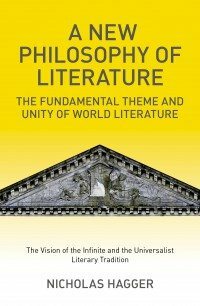 Starting with the written works of the ancient world he lays out the fundamental tradition of world literature and creates a new philosophy of literature.